This voyage provides the opportunity to experience everything Spitsbergen has to offer, from polar bears and walrus to spectacular scenery. Aboard Ocean Nova, you’ll be treated to daily presentations by your Expedition Team onboard the ship and daily wildlife sightings on land. Hike, explore and enjoy the beauty of the Arctic on your visit to Spitsbergen. You’ll cruise around this magical island on a constant search for wildlife. Your expedition will cover western Spitsbergen as well as stunning fjords and outlying islands to the north. From polar flora to immense glaciers, the natural landscape here is just as varied as the wildlife. Each expedition presents new opportunities and different weather and ice, so there is no fixed itinerary; however, we do have some favorite destinations, including the 14th of July Glacier, Smeerenburg, Alkefjellet and the Hinlopen Strait. The destinations visited will be selected for optimum wildlife viewing and appreciation of the history and geology of Spitsbergen. Polar bear viewing is almost guaranteed, with Hornsund being one of their preferred hunting areas, and the towering cliffs of Alkefjellet providing many free bird egg meals for both them and the arctic fox. Poolepynton is great for walrus viewing and photography. Coming across a walrus haul-out is a moment you won’t forget. These lumbering giants of the Arctic create quite a noisy scene as each walrus vies for a choice spot of coastline. If you’re itching for a more personal and intimate view of the arctic scenery, then taking an optional kayaking excursion to some of the more isolated pockets of Spitsbergen is highly recommended. Smeerenburg is a great place for an optional snowshoeing excursion, if conditions permit. You can visit a memorial erected in 1906. This historical site honors the whalers who lost their lives in the 17th and 18th centuries while working in extreme arctic conditions. There is no shortage of natural beauty in Spitsbergen. The tundra can be surprisingly colorful in summer, with wildflowers bursting for a taste of sunshine. Each day, you’ll see something new, whether it is a rare bird species, a polar bear on the hunt, or a century-old abandoned hut. Embracing the unexpected is part of the legacy – and excitement – of expedition travel. When travelling in extremely remote regions, your expedition staff must allow the sea, the ice and the weather to guide route and itinerary details. The above is a tentative outline of what you’ll experience on this voyage; please be aware that no specific itinerary can be guaranteed. The ice-strengthened expedition ship Ocean Nova was built in Denmark in 1992 with high ice class to serve Greenland’s west coast. In 2004 to 2005 she was completely refurbished and has now a career as a small and comfortable expedition ship. The Ocean Nova accommodates 86 passengers in single, double and triple cabins, all with sea-view and private facilities. 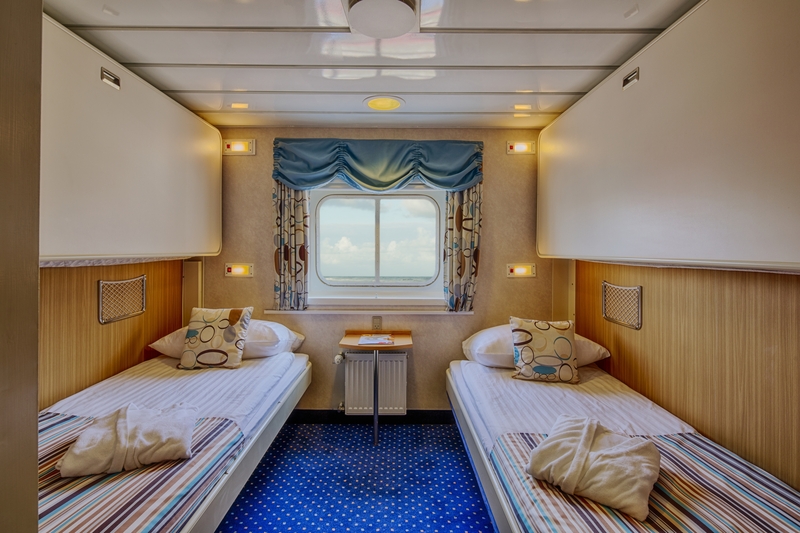 The double cabins have either two lower beds or upper and lower beds. The triple cabins have upper and lower beds. In your cabin you will also find a desk with chair and ample storage space for clothes and equipment. In the dining room you are treated to delicious meals in between landings and in the panorama lounge you can enjoy a drink with a breathtaking view of the surrounding polar landscape. This is where PolarQuest’s on board specialists entertain and educate you with lectures on polar biology, history, geology and conservation. There is also a library with panoramic views and a good selection of polar books. On board there is a satellite phone, gym and medical doctor. Passengers are welcome on the bridge around the clock and there is always something to see or search for from the spacious observation decks. The ship has North European officers and there is a friendly and informal atmosphere on board. Travelling with this small expedition ship offers an entirely different experience and perspective than you can get on a larger and more conventional cruise ship. Some Deck plans may vary, please contact us for more details. Kayaking in the Arctic is probably one of the most intimate and inspiring ways you can explore the rugged coastlines and calm bays of the regions we visit. Kayaking in the Polar Regions is highly weather-dependent, however we guarantee at least one outing throughout your voyage, but your kayak guides will take you out as many times as possible throughout your voyage. From the charming city of Reykjavik, to the therapeutic waters of the Blue lagoon, and the bubbling hot springs of Thingveller National Park, you will be mesmerized by the unique beauty and striking geography of this Nordic island. Iceland offers adventures for every activity and skill level – ask about the other options available to enjoy the fresh air and explore the dramatic landscape.